I'll let you in on something I didn't know: 68 percent of women confessed their dirtiest secret - they actually enjoy cleaning their homes! Are you one of those women who actually enjoy cleaning? I admit, that it's hard for me to get started, but once I get going, I love the feeling of satisfaction behind tackling household dirt and clutter. In fact, when armed with products that make my effort go farther, I can get excited about my "cleaning days." Wanna Win? To be entered to get the Soap Scrum Remover, just tell us how you feel after cleaning your home. You can choose one of the emotions above, or reveal your own! You have until January 29th at 11:59 pm CST to get your entries in. One per person, please! 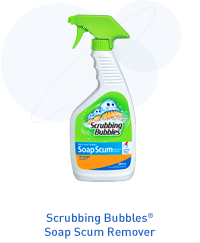 Found out more about the entire Scrubbing Bubbles by following them @ScrubbingBubble on Twitter and joining their Facebook page! *Sample was provided for this promotion. I feel proud for sure, and also satisfied when everything's nice and clean! I feel like I have accomplished something although I know I will have to do it again soon! I feel relieved that I'm done--at least until the next mess crops up! Accomplished is a good one! After cleaning my house I feel so much cleaner. I feel better after cleaning.